I work in Downtown Los Angeles which is both a pro and a con. It's a con because it's super congested and both traffic and parking can be generally atrocious. However, one major pro is the multitude of amazing and yummy eateries all competing for the working stiff's lunch dollar. The most brilliant invention ever (in the mind of a hungry Angeleno) is UberEATS. If you don't know (cue the Stephon impersonation:) it's this thing where an Uber driver pulls up in front of your job, hands you a box of food and drives away. Seriously, I'm really impressed with how seamless the transaction is. No money is exchanged because funds are deducted from your Paypal account when you request delivery. You get a text when your driver arrives and you meet them out front to collect your food. That's it. You had me at pink boxes. One minor drawback (if it's even a drawback) is that the menu is limited about four options per day. However, it changes daily to introduce users the most popular items from some of the best restaurants in the area. My co-workers and I have been using the service a lot lately and have discovered some pretty spectacular restaurants via UberEATS. One such restaurant is Bottega Louie on 7th and Grand. I thought I was just ordering a boxed lunch, but I got that and so much more. For $10 I received what can best be described as the grown up version of a turkey sandwich, a delicious edamame salad, a bag of homemade potato chips and two fresh macaroons (Early Grey and Vanilla) all neatly packaged in a way-too-precious-for-a-turkey-sandwich pink box . Bottega clearly knows that presentation is everything. I've since driven by a time or two and noted the décor of the café is just as pleasing to the eye. Raspberry & Chocolate Macaroons included in UberEATS lunch box. Looking at their full menu made my mouth water. Brunch items include Salmon Millefeuille (smoked salmon and crème fraiche layered with puff pastry) and Lemon Ricotta Pancakes which you may enjoy with a mimosa or a bellini. I've also heard great things about their small plates for lunch. I'm dying to try their Portobello Fries and their Crab Beignets. 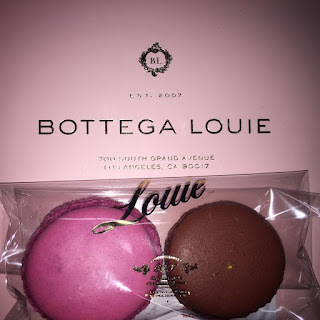 Yes, there are many places in Los Angeles where you can get a good meal, but what I really appreciate about Bottega Louie is their commitment to serving fresh food of the highest quality. 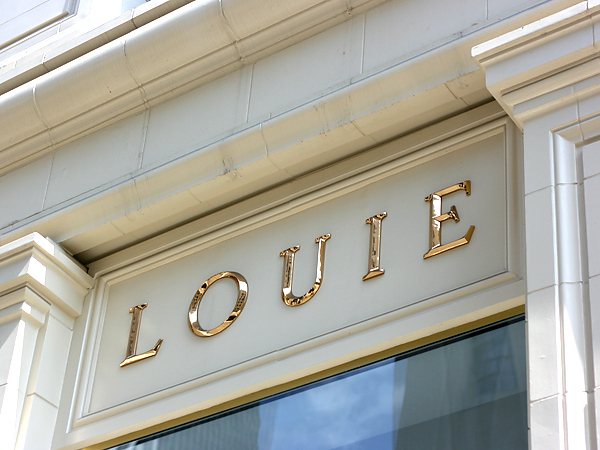 Their menu boasts "Free Range Poultry," and "Sustainable Seafood." 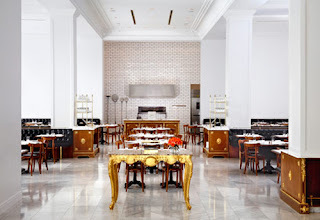 Combine that with a high end atmosphere and reasonable prices in historic Downtown L.A. and what you have is a dining experience like none other. And that, my friends, is priceless.